I’ve incorporated random magic effects in a number of my games over the years – from the splendorous Rod of Wonder in 2nd and 3rd edition, to the Rings of Cwell the Mad – a personal invention of a mad mage, each activating an utterly random effect centered on the bearer when donned, each removable only by the Remove Curse spell. For these items I resorted to one of my all time favorite DMing tools – the Net Libram of Random Magical Effects. This incredible, perhaps insane, document contains – brace yourself – 10,000 unique magic effects. This range from #0027 “A framed photograph of the caster falls at his feet”, to #2267 “The caster’s left arm is twice as long as his body”, to #8307 “A heard of gigantic buffalo stampede through the area” and many, many, many more. For a recent campaign, however, I found myself in need of a new sort of random magic effect table. The set up as simple as it was insane: the god of the sun (Pelor, if you will) has been murdered – or nearly so. 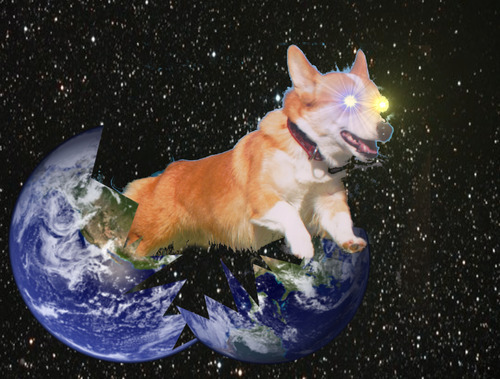 A single tiny spark of his divine essence survived and has been reborn on earth in a lesser form – that of a cheerful corgi. The PC’s find themselves responsible for shepherding the dog back to his godhood – a process that involves theconsumption of much magic by the animal deity. In order to drive home the power of this particular corgi, every time He consumed a magic item He would “expel” a random magic effect. I wanted these effects to be awesome, occasionally world shaking, and at least vaguely thematic. As a result, I drafted this list of 100 random dog/god effects. I hope you can add this to your own god-reborn-as-a-dog campaign setting, or at least as one more resource for random magic fun.